Fire crews are still active in the Cathedral. "It felt like I was looking at a bombing," Marsset said of the cathedral, where he was ordained a priest 31 years ago. "It was hell," he said, describing the moment when the blaze was discovered on the soaring roof shortly after evening mass ended shortly before 7pm (1700 GMT) on Monday. Her eyes filled with tears as she watched the cathedral from the riverbank. "For me, this place is the centre of the world. It carries the history of France and beyond. And also the history of my own life, and 800 years before." Aurora, 33, an Italian living in Paris for the last half-decade, said she had jumped on her bicycle before dawn "like paying tribute to a sick elderly parent". "Notre-Dame, it's like the Eiffel Tower, it's like my grandmother. It's like the Colosseum in Rome had burned down. I had to go," she said. "Those who built it are no longer with us. Do we know all its details, all its secrets?" asked Christelle, a 27-year-old Congolese student. 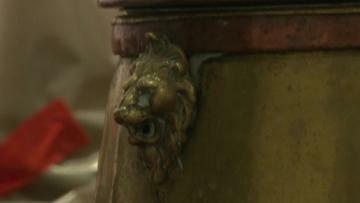 Town hall offers temporary refuge for cathedral treasures. "We had things planned for Wednesday, Thursday, Friday. We don't yet know where to do these. It's as if our mother has been wounded," he said.